Find out what's lifted these big players so far so quickly. It's easy to forget during turbulent markets that over the long haul, stocks have helped long-term investors create life-changing wealth. Even just using index funds, disciplined investors who've put money to work regularly in the stock market have seen their savings climb dramatically. Those who've identified promising niches of the market have done far better. Marijuana stocks have gotten a lot of attention lately because of the trend toward greater acceptance and legalization of cannabis products. That reached a peak when Canada legalized recreational marijuana earlier this month, but even after a healthy pullback in cannabis stocks, longtime investors in the space have seen impressive gains. If you'd invested $10,000 in equal parts in marijuana stocks Canopy Growth (NYSE:CGC), Cronos Group (NASDAQ:CRON), and Aurora Cannabis (NYSE:ACB) on various Canadian stock exchanges three years ago, you'd be sitting on a portfolio worth more than $200,000 today. The big question now is whether these three key cannabis leaders can keep up the positive momentum. Canopy Growth has the strongest reputation among marijuana investors, largely because it's gotten the most attention from the mainstream corporate world outside of the cannabis industry. Canopy has attracted two separate investments from beer giant Constellation Brands (NYSE:STZ), including a nearly $4 billion investment just a few months ago. The deal has helped raise awareness of the entire sector, and other marijuana companies have sought partnerships of their own in order to give them the cachet that Canopy Growth has. Canopy has become a leader in the industry because of its immense production capacity, which puts it squarely at the top of the business currently. Yet Canopy isn't content to rest on its laurels, and it's working hard to expand production further. At the same time, the cannabis company's early success in creating its Tweed brand of cannabis products demonstrates its business savvy. Even with its stock having jumped almost 1,800% in the past three years, Canopy Growth has more room to run higher. Cronos Group has the distinction of being the best-performing marijuana stock of all time right now. Despite having seen a pullback over the past few weeks, Cronos has posted gains of more than 2,700% over the past few years. Having formerly been known as PharmaCan Capital, Cronos has been a big player in the medical marijuana segment of the cannabis industry. Like Canopy, Cronos has worked hard to boost its production capacity. Another avenue for growth involves international distribution, with partnerships giving it access to markets in Australia, Israel, Germany, Poland, and various points in Latin America. With a new collaboration with Ginkgo Bioworks to develop cannabis derivatives of high purity, Cronos hopes it can tap into growing markets for both medicinal and recreational use. If it's successful, that could lead to even bigger gains for Cronos. Finally, Aurora Cannabis is best known for its recent listing on the New York Stock Exchange. Yet even before that, the stock managed to produce gains of 1,400% on exchanges in Canada. Aurora has focused its efforts on building up production capacity as quickly as possible, trying to keep up with and surpass Canopy Growth with projects including its Aurora Sun facility near the Edmonton International Airport and similar growth facilities in eastern Alberta and in Denmark. With investments in other players in the cannabis industry, Aurora is also trying to stay diversified and build key collaborations that it can use to grow more efficiently. That'll be essential as it strives to maintain its competitive position in the rapidly evolving marijuana market. 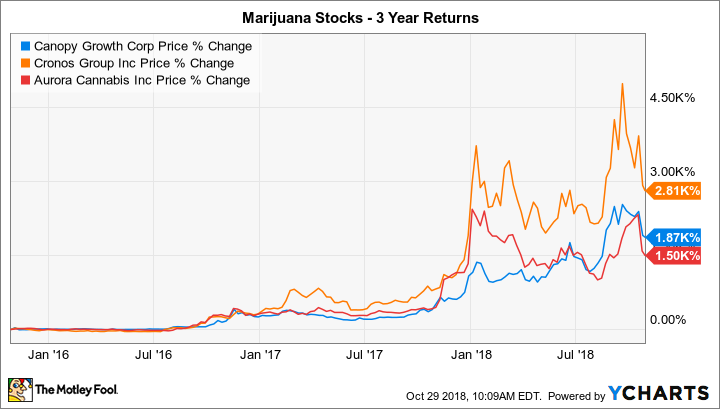 Marijuana stocks have produced amazing gains, and now that they're squarely on the radar of mainstream investors, it'll be hard to see 20-fold increases from current levels. Nevertheless, for those who see the potential profits from cannabis, Aurora Cannabis, Cronos Group, and Canopy Growth all deserve future attention to see how they can build on their early success.